Yesterday started off like any other Tuesday. I got to work, booted up my laptop, opened my email, downloaded this week’s edition of Rave and had a quick read. On Tuesday mornings work can wait. My day was brightened by one of my photos from Saturday night’s School Of Seven Bells photos being printed in amongst the live reviews. My Tuesdays are brightened each and every time one of my photos gets printed. Tuesday lunchtime always follows the same routine; a walk up to the Valley Mall to pick up a paper copy of Rave from Ric’s, picking up some lunch and getting back to the office to have a proper read through. Tuesday afternoon wasn’t like any other Tuesday when out of nowhere came the news that after 21 years and 1,047 editions Rave was closing. Yesterday’s edition would be the last. Not much work got done yesterday afternoon. Not much of anything got done between staring out of the window at the black skies and heavy rain, appropriate weather for the occasion, and pressing F5 to refresh the various social media and forums I had opened to try and comprehend what was happening. There was little activity on the Rave staff forum; I think, like me, every one was too numb to be able to put it into words. I’ve been photographing for Rave for almost five years. The first thing I did for them was Valley Fiesta back in August 2007 when none of their photographers were interested in covering it and I was eager to break into photographing for street press and available and more than keen to spend three nights in the Valley. It’s been a true honour to have worked with the Rave team over the five years. I’m proud to have been associated with them and proud of the opportunities that they’ve given me and of the photos that I’ve taken for them down the years. I’m glad I ended up photographing for them. There’s always been honesty, integrity and decency about them as well as a real interest in what’s happening in Brisbane and it shows in the paper they delivered week in, week out. It’s more than you can say for some of the other street press publications and websites in Australia. As an independent publication, Rave always felt more true to the adventurous independent spirit, more than being one cog in a faceless corporate machine. As far as I’m concerned, Brisbane has lost its best street press magazine. From a personal point of view, losing Rave is utterly devastating. Since the start of 2009 (when I started properly recording the details of the shows I cover), I’ve covered 144 gigs and festivals for Rave, photographing a grand total of 429 acts (the majority of the 56 shows I photographed in 2008 would also have been for them). The shows I’ve covered for Rave make up almost than 70% of the total shows I’ve photographed in that time, almost 80% when you only consider the last couple of years. It’s been the mainstay of my music photography over the last five years and leaves a really big hole in my life. Being a photographer is a whole different ball game to being a reviewer. If you love music and love writing and want to review, there’s nothing stopping you. If you want to review an album, at the very worst you can buy it, and with online streaming via Spotify, Rdio etc, you don’t even have to do that these days. If you want to review a live show, at the very worst you can buy a ticket. You can review any show, however high profile it is, and give the world your opinion. As a photographer, you don’t have those options available. I could buy a ticket to a show but that doesn’t negate media accreditation and camera policies for anything but the small local shows. I’ve always considered (and think have written it at least once within this blog) that I’ve only ever been a couple of changes of editor away from losing the opportunities to do what I do. What I love to do. I always said that if that happened I would just go back to paying my door fee, taking my camera and taking photos for myself. It’s how I started, I think it’s how every music photographer should start. But the live music scene has changed so much in Brisbane in the last few years and contemplating this scenario in the cold light of day is a whole lot more difficult taking into account the small venues that have come and gone since I moved to Brisbane in 2005 and that most of the rest that remain have camera policies. Even Ric’s has a camera policy (or at least it had one under the old regime). With Rave closing, I’m not going to be able to photograph at The Zoo, The Tivoli, The Hi-Fi, which have made up the majority of the shows I’ve covered so far this year, let alone any of the bigger venues. The Zoo has been my most attended venue for photographing every year since 2008, a total of 69 gigs over that time. Looking back only a couple of years to 2010, most of the smaller venues without camera policies that I photographed at are long gone; the likes of Rosie’s, The Step Inn and The Hangar. Many of the other remaining venues I photographed at where I wouldn’t/didn’t need media accreditation were random/free events at random, irregular venues; Unconvention at The Edge and free stuff at Burnett Lane, The Powerhouse, Paddington Fair and Brunswick Street Mall. There were a few random shows at Lightspace, The Legion Club and The Old Museum but not much, if anything, happens at those places these days. For now I’ve still (hopefully) got opportunities to photograph festivals for The Vine but with all the upheaval at Fairfax in the last week, I’m not sure how long that will continue. I guess I always thought Rave would always be there and if I was lose any opportunities, the ones to go first would be the bigger/more glamorous/higher profile festivals that I’ve photographed for The Vine in the last couple of years. My ‘day-to-day’ photography opportunities would always be there. I don’t photograph for the money. As photographers never get +1s for shows, I often find myself in the situation of essentially having to pay to photograph. Saturday’s School Of Seven Bells show was a prime example of this, in that buying a ticket for my girlfriend meant that even if Rave printed a photo in that week’s paper and paid me for it, financially I’d be down on the night even without taking travel and drinks into account, let alone anything like my time to process the photos or equipment deprecation. Like I said, it’s not about the money, it never has been. I have little interest in actually ‘being’ a photographer. I have no interest in doing weddings, corporate events, product photography or social photos. I just want to do music photography, plain and simple. Photography is my escape from a much more mundane 9 – 5 existence. A pretty unexciting job but one that I’m good at and one that pays me well. If I took photography seriously it would become a job and I know it would become a chore and destroy my love for it. Plus I’d have to be nice to people. Bands would stop being good bands and bad bands and all become ‘potential clients’. My blog would become another of those nauseating music photographer blogs where everything is brilliant, every band rocks out and no one ever plays a bad show. My Tuesday routine also involved scanning the gig calendar at the back of the paper and updating my diary with potential shows I want to cover, often months in advance. When the fortnightly Concert Calendar email came around I didn’t really need to even look at it, I already knew the shows I wanted to photograph. I expect that my replying email listing the shows was one of the first that they received back. I didn’t get all the gigs I requested but got more than my fair share and most of the shows I wanted to see and photograph. I guess by the time you’re a regular photographer for a street press publication you’ve achieved some degree of recognition and respect for doing what you do. It’s a career progression of sorts. Are there any currently attractive alternatives to replace Rave? Not being interested in social photos put a number of online publications instantly off the radar. I want to choose the regular shows that I go to, I don’t want to be asked and expected to cover a gig that I have no interest in seeing and whose music I don’t like, which crosses a few more publications off the list. I want more input than just “yes” or “no”. I’m not interested in having to compromise myself by having to do something I’m not interested in to be able to do the bit I really want to do. I’m doing it for love, for escape, for fun, something that I enjoy doing and something that makes me really happy (dispute all the grumbling about venues/lighting/late shows/punters etc). Plus I like photographing for a printed publication. There’s nothing better than seeing your work in print; on screen isn’t the same. There is talk of a possible reprieve for Rave, if a buyer can be found. Although a buyer would be the first step, it’s also important that it’s the right buyer. With work taking me down to Sydney and Melbourne I get to see the other street press publications fairly regularly, I’ve seen what the other major eastern cities get each week and some of it is less than pretty. From a photography point of view I would hate a revived Rave to become a publication where the focus was a lot more on social photos than live music photography. When I say a lot more, I mean pages of the stuff. 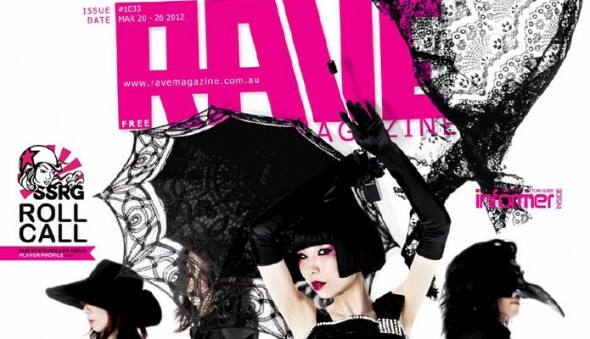 I would have thought if a buyer were to come forward, it would be more likely to be an established publication business and so Rave would lose its independence and could become just another street press paper, with no guarantee that it would be put together in Brisbane and/or have to follow the corporate editorial line. Whether or not a buyer will be found will come out in the wash. At the moment it would be the most attractive alternative, especially if they are looking for music photographers. Fingers crossed. This entry was posted on Wednesday, June 27th, 2012 at 3:29 pm. It is filed under Music Photography and tagged with 2012, Brisbane, magazine, Rave, Street Press. You can follow any responses to this entry through the RSS 2.0 feed. I’ve only been shooting for Rave for a few months, but I feel your pain completely. Like you, I’m the same. Photography is a side passion. I never want to do the 9-5 grind of it, taking photos of things that don’t interest me. I want it to be there at the end of a day as a distraction of something I enjoy. And I do. Also, in regards to the Zoo, they’ve only ever denied me my camera once without a photo pass, and that was Omar Rodriguez Lopez group. Over the last year I’ve just called them before the gig and asked. Most performers don’t care, and the door staff there will find out for you. Even the HiFi has let me in once. Just ask ahead, or ask the performer. It’s the best way to take photos without the stress of submitting any.